Windows Media Player (WMP) 11 is a great media management tool, but you can make a handful of key changes that will improve its performance. These changes will save you no end of frustration and headache in the long run. While running Windows Media Player, hold down Alt and choose Tools→Options. You see the WMP Options dialog box. WMP shows you its Rip Music settings. Click the Change button, navigate to your PublicPublic Music folder, and click the OK button. This change will place the music that you rip in a Public folder (which makes it available to others on your computer and your network). 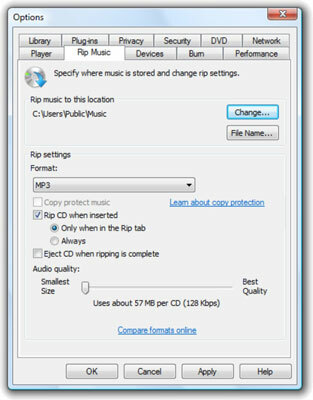 In the Rip Settings Format drop-down box, tell WMP that you want to rip your music into MP3 files. You will notice that, ahem, immediately after selecting MP3 as your ripping format of choice, the check box that says Copy Protect Music goes gray. You can’t protect MP3 music. Congratulate yourself. You just made one of the most important timesaving changes possible in all of Vista-dom. If you choose to rip into the WMA format, and the Copy Protect Music box is checked, every time you rip an audio track, WMP marks the file so that it can be played only on the machine that ripped it. If you’ve ever tried to play a WMA file that was created on a different PC and it wouldn’t work, now you know why. WMP shows you a list of all the music-related hardware in your computer. 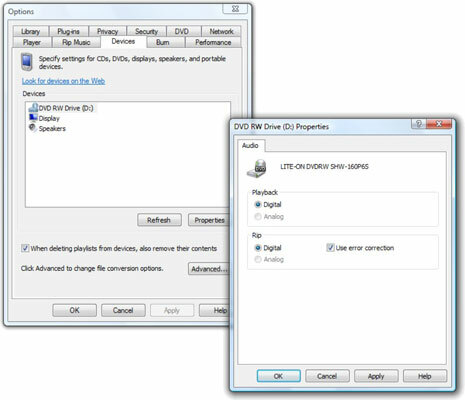 Choose the DVD or CD drive that you use to rip music and click the Properties button. Make your DVD or CD drive try its best to recover scratchy songs. You see a DVD (or CD) Properties dialog box. Check the box marked Use Error Correction. Checking this box is no guarantee that your CDs will rip perfectly, but if you have a marginally scratched CD, at least WMP will try hard to recover the original music as best it can.